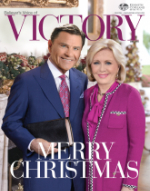 Thank you Gloria and Kenneth Copeland and the rest of the KCM team for all that you are doing and for your prayers. I have been greatly blessed by your books and teachings. During 2015 I was admitted to the hospital’s intensive care unit. I was hospitalized for nearly two weeks and was diagnosed with severe liver failure. My liver enzymes were a thousand times the normal value and in all my years as practicing as a medical doctor I have never seen a liver function test that severely deranged. After a few days in hospital my liver enzymes started decreasing.God has healed my liver completely and my liver function is now completely normal. My doctor was amazed when he examined me during my follow up consultation and said that I had reached a stage just before you go into a coma. God still does miracles today. We serve a God of the impossible!